Newcastle United have confirmed the signings of Nottingham Forest defender Jamaal Lascelles and goalkeeper Karl Darlow for an undisclosed fee. The English duo will be sent back on loan to Forest for the 2014-15 season. Newcastle manager Alan Pardew said: "It is a real coup to have signed two of the finest young talents in English football outside the Premier League." Forest boss Stuart Pearce said on Monday that Lascelles, 20, and Darlow, 23, had been sold against his wishes. Centre-back Lascelles came through the ranks at the Championship club before making his Forest debut in January 2012. He said: "It's a huge step up for me. Newcastle are a club with a massive fanbase, a big history and an unbelievable stadium." 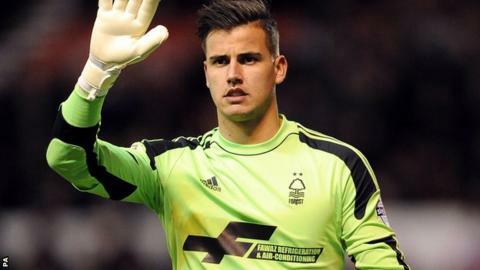 Darlow, who was on Aston Villa's books as a schoolboy before joining Forest at the age of 16, established himself as the Reds' first-choice goalkeeper last season and has made 67 appearances for the club. He said: "I'm delighted for it all to be sorted and I can't wait to get started here at Newcastle. "The loan back is going to be another year but it gives me time to develop my game further before I return." On Friday, Forest manager Pearce insisted he still had a healthy relationship with chairman Fawaz Al Hasawi, who said the club had to sell to meet Financial Fair Play rules. Pearce, who is the fifth full-time manager to have worked for the Al Hasawis since the Kuwaiti family bought Forest in July 2012, was reassured by the £7m double signing of Michail Antonio and Britt Assombalonga.